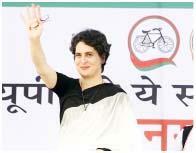 New Delhi, Feb 10 (IANS) Expressing shock over the death of nearly 100 people in the Uttar Pradesh-Uttarakhand hooch tragedy, Congress General Secretary in-charge of Uttar Pradesh East Priyanka Gandhi on Sunday blamed the BJP governments in the two states for allowing the illicit liquor industry to flourish. "I am shocked and very sad to know that more than 100 people have been killed in Uttarakhand and Uttar Pradesh and the death toll continues to rise," Priyanka Gandhi said in a statement. "It is hard to believe that the illicit liquor industry in the two states is operating without the support of the respective state governments. "I hope that the BJP governments will take strict action against the criminals and appropriate compensation and provision of government jobs will be made for the families of the deceased," added Gandhi, who recently took over as the AICC General Secretary in charge of east Uttar Pradesh. The death toll in the hooch tragedy has increased to 97 and over 200 people have been arrested so far in a police crackdown, officials said on Sunday. All the deceased had gone to Balupur village in Uttarakhand's Roorkie for an after-death ritual where they were apparently served spurious liquor.